There are a handful of authors with writings published in Library of America volumes who have been honored with feast days in the liturgical calendar of the U.S. Episcopal Church—including such eminent figures as William Lloyd Garrison, Sojourner Truth, and John Muir. Another such writer is Ralph Adams Cram. This year’s feast day, on December 16, also marks the 150th anniversary of his birth. Although he had anonymously and privately published a short novel (The Decadent) in 1893, Cram’s literary fame is based entirely on six tales that appeared two years later in Black Spirits and White: A Book of Ghost Stories. The collection includes his most famous (and most often reprinted) story, “The Dead Valley,” which H. P. Lovecraft later singled out for achieving “a memorably potent degree of vague regional horror through subtleties of atmosphere and description.” The other stories, too, have appeared frequently in anthologies compiled throughout the last century. Although Cram lived for another five decades, he never again published works of fiction. You might be thinking that a mere half dozen ghost stories, no matter how well known or well written, seem too slight to justify honoring an author with his own feast day—and you would be right. Because Cram, who converted to Anglo-Catholicism in 1887 during a stay in Rome, became one of the leading architects of his day, known especially for his Gothic Revival buildings that dot city centers and college campuses throughout the United States. Among the five hundred projects in his portfolio are the Cadet Chapel at the United States Military Academy (West Point), the Church of the Covenant (Cleveland, Ohio), Fourth Presbyterian Church (Chicago), the notoriously unfinished St. John the Divine (New York City), Doheny Library at the University of Southern California, and more than two dozen buildings on the Princeton University campus. 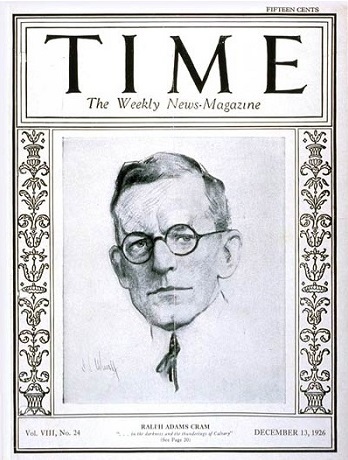 Cram’s “skyward” wonders had become so ubiquitous that Time magazine featured him on the cover of its December 13, 1926, issue. The architectural firm founded in 1889 by Cram and Charles Francis Wentworth still exists (known as Cram and Ferguson since 1913). I have a friend, Olof Ehrensvärd, a Swede by birth, who yet, by reason of a strange and melancholy mischance of his early boyhood, has thrown his lot with that of the New World. . . . If you don't see the full selection below, click here (PDF) or click here (Google Docs) to read it—free!